The purpose of this class is to teach how to communicate more like an American professional, and to increase the professional’s confidence when speaking in business contexts. This course focuses on building business vocabulary and increasing an understanding of how English is really spoken in the American workplace. Please note this class is for graduate students/scholars at American universities, professionals with high levels of English language proficiency, and Advanced level MLC students. 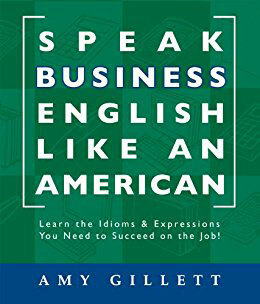 This course is based on the book, Speak Business English Like an American, written by Amy Gillett , a MLC adjunct instructor. Please email or call MLC to learn about class dates and times, and to register for this class. Amy is a leading author on business idioms and expressions. She has taught executives at the U of M Ross School of Business and is a graduate of Stanford University and Cornell University. MLC can create custom lessons for business and academic professionals based on their English proficiency level and needs. Complete the Professional English Inquiry Form to contact our directors regarding your interest in private and small group lessons. Professionals who need help with general English can enroll in our Reading, Writing, Grammar, Speaking and Listening classes. These classes are offered 9:00am to 5:30pm at MLC.